David Smith, perhaps better known as ‘The Flintman’, has been working in Lewes and the surrounding area for more than twenty years (see www.flintman.co.uk). His talk will be a brief look at the history of flint, its use and its versatility as a building material. With local references, the talk will also look at how flint has given Lewes its local distinctiveness. This includes looking at the good, the bad and the unusual. As well as many visual images, the talk will include a demonstration of the art of flint knapping. As usual the meeting will be at the King’s Church building, Brooks Road, and all will be welcome. Coffee and biscuits will be served from 7 pm. Do you have a window that faces the street? Would you be prepared to put up an A4 poster advertising the LHG talks each month? If so, it would be really helpful for spreading the word about what we do. Please email leweshistory (at) gmail (dot) com and I will get in touch. 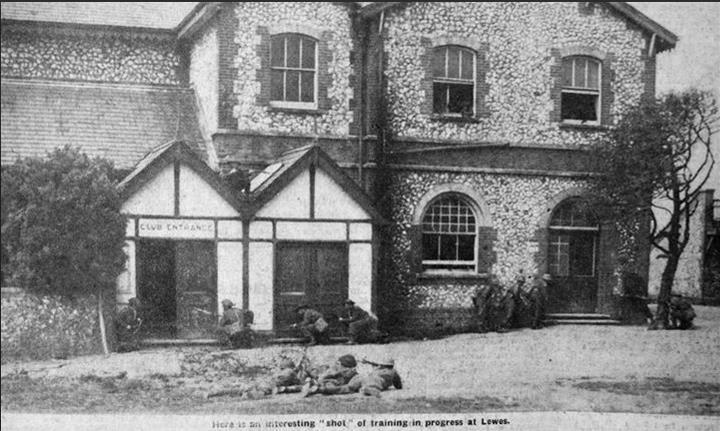 I am trying to identify the building in this Sussex Express wartime photo of a Lewes Home Guard mock attack. A clue is that the left-hand door has the words “Club Entrance” above it. Suggestions to date include the back of Lewes Grammar School, or alongside the wall of Lewes Prison. Any other ideas to hildergen (at) aol (dot) com. David Joyce raised a question at our January meeting about the history of the Riverside Centre (1 High Street), which he identified as having been the Etna Ironworks run by Charles Aspull Wells until he went bankrupt, and assigned the business to creditors, in 1891-3. According to an obituary Charles Aspull Wells was born in Lewes and lived in the town for his whole life. He was baptised at St Michael’s, the son of Charles Samuel Wells and his wife Harriett, on 27 March 1827. In 1842, when he left school, he went to work for the Lewes ironmonger Henry Attwood Thompson, working both in the workshops and in the office. It was Charles Wells who prepared their catalogue when the firm exhibited its wide range of agricultural implements at the Royal Agricultural Society’s 1848 Show at Lewes. The 1861 census identifies Henry Attwood Thompson as an ironmonger aged 45, from Hadley, Shropshire, and employing 22 men and 5 boys. He was a widower aged 45, with his sister as housekeeper and also a domestic servant. The census sequence indicates that they lived on the High Street at, or very close, to 1 High Street. In this census Charles A. Wells lived in East Street, also in All Saints parish. He was described as an ironmonger’s clerk aged 34, with a wife Anna, two young children and a teenage servant. In 1869 Charles Wells took a 14 year lease of a house, workshop and factories near the bridge in Lewes, identified on a plan, from the trustees of Henry Attwood Thompson, who was by then a lunatic. He remained there until the business went bankrupt over 20 years later [ESRO Acc.5902/1]. The 1881 census shows Charles Aspull Wells aged 54, born in Lewes, living at 1 High Street, Lewes, as an ironmonger, engineer and founder employing 16 men and 1 boy. His wife was from London, and they were accompanied by 4 children aged between 22 and 5 and two domestic servants. His 22 year old son, Charles Richard Wells, was described as an agricultural engineer and machine maker. Charles Wells of the Etna Ironworks advertised a range of agricultural machinery for sale, and by the 1880s he seems particularly to have specialised in dairy equipment for the many small dairy farms in the area around Lewes who served the London market via the Glynde Creamery. However, he also had wider interests, advertising in the Sussex Express in 1888 as an electrical engineer who was the Lewes agent for the New Telephone Company, under license from the Postmaster General. 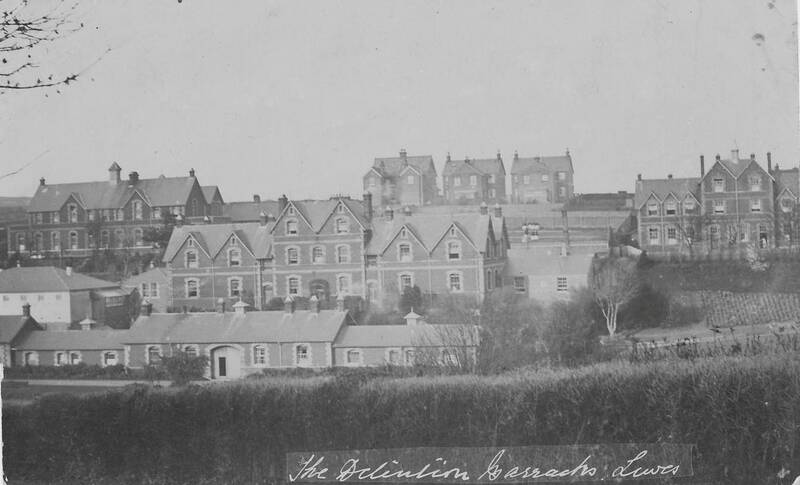 From 1881 he was a councillor on Lewes Borough Council, chairing its finance committee in 1885. His memorandum book survives in The Keep [ESRO/DL/D/149]. The Etna Ironworks survived his bankruptcy, but had to move its base. 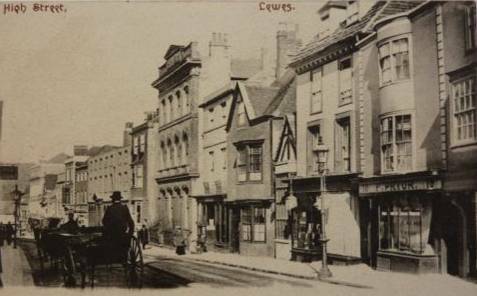 In 1892 a ‘very desirable freehold residence’, 219 High Street, was advertised for sale in the Sussex Express. This is today the address of W.H. Smith’s shop, and must then have been pretty well buried in the side of the railway embankment where it ran across the High Street. In May 1896 Charles Aspull Wells, engineer, of the Etna Ironworks, gained planning permission for a new shop front there. An 1899 directory describes Charles A. Wells, A.I.E.E., as a mechanical and electrical engineer, ironmonger and agricultural implement maker at the Etna Works, 219 High Street. The 10 August 1901 Sussex Express reported the death of the wife of Mr Charles Wells of the Etna Works, ‘our esteemed townsman’. His own death occurred suddenly on 6 April 1904, at the age of 78. C.A. Wells & Co, electrical and mechanical engineers, Etna Iron Works, survived his death, and appear in local directories at 219 High Street and Eastgate Wharf until 1915, with one of his sons, Herbert Henry Wells, also listed at 219 High Street as an insurance agent. 219 High Street became a clothing store in 1916, but C.A. Wells & Co continued to be listed at Eastgate Wharf into the 1930s. In 1916 H.H. Wells, electrician, was listed at 6 Albion Street. 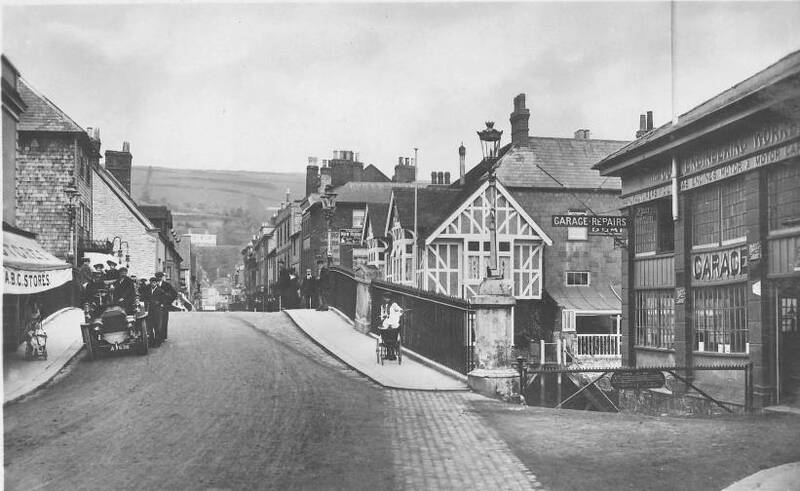 Both Charles Wells’ premises went on to become motor garages. The Riverside building was the Ouse Engineering Works in 1906 and became Martin’s Motor Garage and Repairing Works by 1910. 219 High Street served as Mansfield’s Lewes branch, selling Fords in 1927 but Vauxhalls in the 1940s and 1950s. Martin’s Garage, at 1 High Street, is shown in the right foreground of the early 20th century postcard above, while a predecessor can be glimpsed behind the tree in the 1781 drawing by James Lambert in the ESRO collection (below). West partly to the said tramways and railways and partly to the occupation road leading from Leighside to the High Street. David concludes from a plan with the lease that the dwelling house, 1 High Street, was that now Forfars the bakers, and that the Etna ironworks extended as far down river as the Viper Store. 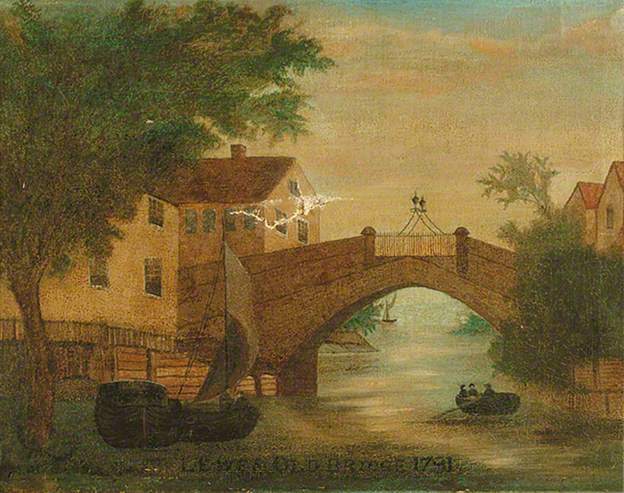 In 1839 Burwood Godlee of Leighside erected a suspension bridge to cross from the Viper Store to his Cliffe warehouse in Bear Yard. 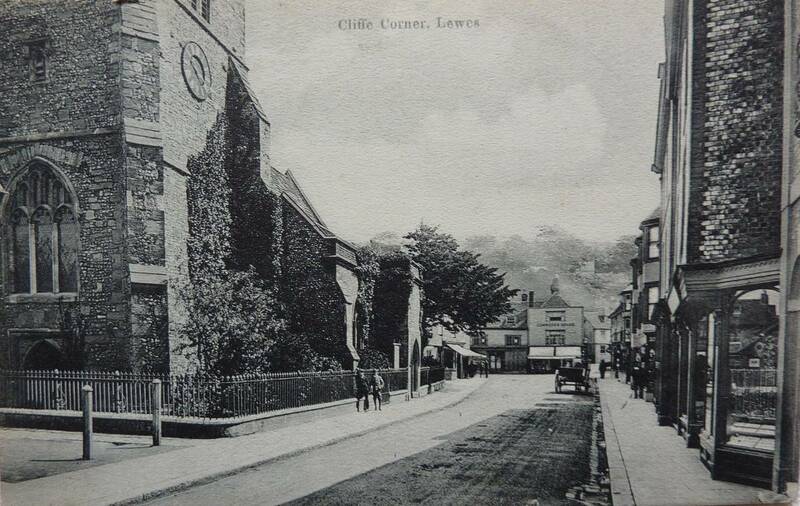 This entry was posted in Economic History, Lewes, Local History, Military History. Bookmark the permalink.